Within the competitive markets in the Washington, DC Metro area, Montgomery County is an ideal location for companies that are not only established but looking to grow and expand their businesses. Recent successes such as expansion announcements by Altimmune and JBG Smith companies, further reinforce Montgomery County’s position as highly competitive, with the infrastructure and amenities in place to attract major players. The county’s 32,600 businesses employ over 370,000 people in key industries including life science, information technology, cybersecurity and professional services. Montgomery is home to 18 headquarters of federal agencies, and ideally located next door to the nation’s capital and its abundant federal agencies, embassies and the seat of power. Located in the busy northeast corridor, we have some of the smartest residents in the country, with 31% holding post-grad degrees. Location, top talent and exceptional quality of life contribute to Montgomery County as an outstanding place to expand or relocate, and we are open for your business opportunity. Montgomery County continued to perform well and add jobs during the first half of 2017. Despite the pause in employment growth, the unemployment rate for Montgomery County was 3.2% as of May 2017, 0.6 percentage points (pp) lower than the regional unemployment rate of 3.8%. Year-over-year, we have experienced job growth in various sectors such as the Professional & Business Services, added 2,096 jobs. The Educational Services sector added 1,850 jobs, while the Administrative and Support and Waste Management Services sector followed suit with an additional 1,657 jobs from last year. With its steady growth, the Health & Social Assistance sectors added 1,290 jobs. The average annual percentage change in employment grew 1.3% for all industries from last year. As of May 2017, Montgomery County recorded 557,672 employees, above the ten-year average of 512,359. Economic conditions are expected to remain robust and healthy throughout the remainder of 2017. Our total growth demand for the county in the next five years is projected to be 15,234 with an annual growth rate of 0.6%, further solidifying Montgomery County is an ideal location to do business. Montgomery County’s positive activity from 2016 continued into the first quarter of 2017. The first quarter ended with positive absorption registering at 142,653 square feet (sf), a 25% increase year-over-year. The vacancy rate saw a downtick of 1.0 percentage points (pp), posting at 16.8%. Significant move-ins included Lockheed Martin’s removing 25,979 sf at King Farm and the National Institutes of Health (NIH) occupying 140,000 sf at 6700 Rockledge Drive in North Bethesda. As the mid-year closed, vacancy increased to 17.5% as significant move outs occurred such as the Agency for Healthcare Research and Quality vacating about 80,000 sf at 540 Gaither Road. 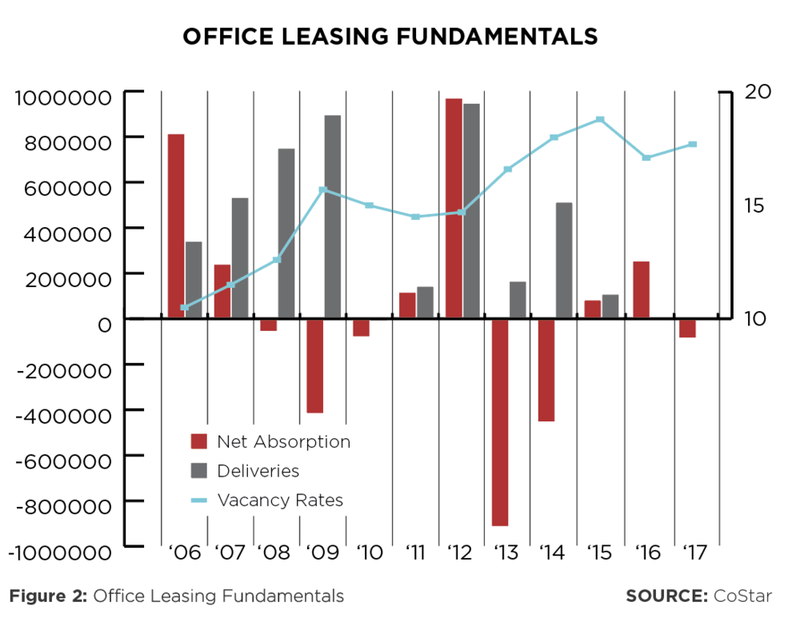 According to Cushman & Wake eld’s Q2 2017 report, year- to-date new leasing totaled 629,152 sf for Montgomery County, capturing 71.9% of activity in Suburban Maryland. Some of the most notable deals: Mental Health Agencies signed for 20,023 sf at 11002 Veirs Mill Road and Guggenheim Partners signed a 15,250 sf lease at 702 King Farm Boulevard. In addition to the new leasing activity, Montgomery County’s overall year-to-date leasing activity posted at 972,491 sf. The most notable deal was Hughes Network Systems renewal at 100 Lakeforest Boulevard for 108,330 sf. Investment sales activity was healthy in the first half of 2017. There were twelve investment sales as the mid-year closed. Notably, Boyd Watterson Asset Management purchased 6701 Rockledge Drive for $43.8 million or $177.03 per-square-foot (psf) and Glazer Properties purchased 15245 Shady Grove from Meritage Properties for $24.8 million, or $136 psf. A 45-asset industrial/o ce portfolio trade between TA Realty and Brook eld closed for $854.50 or $99.36 psf. Foulger-Pratt reached a deal to sell a medical office building on the Holy Cross Hospital campus in Silver Spring. The Potomac based developer sold the asset at 1400 Forest Glen Road in Silver Spring to Nashville-based Healthcare for $24 million. Sales volumes totaled $174.8 million, a 54% decrease from investment sales this same time last year. After a period of constrained construction activity, Montgomery County has been active with upcoming projects that will aid in its growth. There were no new deliveries in the first half of 2017, but there are some notable projects to keep an eye on in the near future. JBG’s 287,000 sf office project at 4747 Bethesda Avenue is expected to deliver by mid-2019. While no pre-leasing has been announced, there is much interest in the building and the developer plans to relocate its headquarters to the new location. Federal Realty Investment Trust (FRIT) is also looking for a second tenant for its project before it starts construction on what would be the second office building at the mixed-use project. Block 3 or 909 Rose, which is located across the street from the new REI, is expected to be a 208,527 sf building and will be the new location for FRIT’s offices. Additionally, Marriott’s new headquarters at 7750 Wisconsin Avenue in Bethesda is still underway with an expected groundbreaking date in 2019. Carr Properties’ project at 7272 Wisconsin Avenue is set to break ground soon. The new home for United Therapeutics, at 1000 Spring Street, is still under construction and is scheduled to deliver in the second quarter of 2018. The 122,000-sf building is a major expansion for the bioscience firm which plans to expand its workforce in the coming years. In multifamily development, JBG Smith consolidated the land for its coming multifamily building on Wisconsin Avenue into one partnership and will begin construction of a 322 unit multi-family building with 20,000 feet of retail. Equity Residential wants to expand its Edgemont apartments near the Metro station. The apartment developer has hopes to add 175 units, on a 19,000-square foot parcel. Weschler’s Auctioneers & Appraisals purchased 40 W Gude Drive Office Building for $6.2 Million. The company had been previously located in Washington D.C. and elected to occupy the entire building at 40 W Gude Drive. Hughes Network Systems renewal was recorded as the largest deal in Q2 2017. The telecommunications company elected to remain in their 111,000 sf office space at 100 Lake Forest Boulevard. Guggenheim Partners leased an additional 15,250 sf in King Farm. The global investment and advisory firm signed at 702 King Farm Boulevard which will help to offset the vacancy of Avendra in early 2018. Developer Federal Realty Investment Trust (FRIT) will be the first tenant occupying approximately 50,000 sf of its next office building at Pike & Rose. The Rockville-headquartered rm is currently looking for a second sizable tenant to begin construction on the new asset. FRIT will be consolidating two office locations into their new office space at Pike & Rose.